Studbook Silver Register: mares & stallions - must have 2 registered parents. Proof must be provided. Must PASS conformation standards. Non-studbook Silver Register: mares & stallions - either one or both parents are unknown / unregistered / unproveable. Must PASS conformation standards. These horses have full showing rights. Must be a genetic silver dilute. Be permitted white markings on the face and legs only, the legs not to be white above the knees or hocks save for a continuous diminishing spear or stripe running above the knee or hock. NO silver may have ANY white markings (ie belly splashes) other than those permitted under the Regulations of the Company. Notwithstanding this, an owner may apply to have a horse or pony accepted for registration under the company's hardship clause which allows for small amounts of underbelly white. BAY SILVER - red pigment on the body is unaffected, while the black on the legs is diluted to varying degrees and the black of the mane/tail is more strongly diluted. This gives the appearance of a horse that is not quite bay, and not quite chestnut either. BROWN SILVER - may be similar to either black silver or bay silver depending on how light or dark the brown base colour is. A DNA test for both types of agouti is required to determine true colour. BLACK SILVER - body colour is diluted to a chocolate-brown or mocha-brown shade, sometimes light enough to appear similar to a sooty palomino. The mane and tail are often near-white, a striking contrast. The lower legs are usually lighter than the rest, almost flaxen near the hoof, and the lower legs are often dappled (which is highly unusual in other colours). The mane and tail often have dark roots. CHESTNUT SILVER - a chestnut horse (or any other red-based colour) has no black pigment to be affected by the Silver gene so will show no effects. As these horses are still genetic silvers they are eligible for silver registration with Dilutes Australia. BUCKSKIN SILVER - composite cream and silver on a black base. May give the appearance of a 'grubby' coloured palomino with off white mane and tail. This is caused by the double dilution effects of cream on the red body and silver on the black points. PALOMINO SILVER - composite cream and silver on a red base. 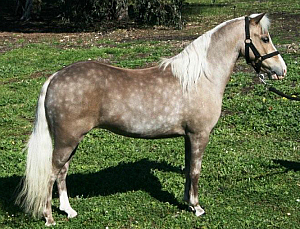 As with chestnut silvers - the silver is invisible although owners report that most known palomino silvers do exhibit a much flatter, lighter coat than a normal palomino. All other silver composites (dun + silver, champagne + silver, pearl + silver) are registered with those respective registers.